Below, you have the option of adding up to 16 additional micro jets to your Hydromassage Whirlpool Bath. Add Additional Micro Jets? You may add up to 16 additional micro jets to your bath, simply select from the drop down list below. Add the therapeutic and relaxing power of Chromotherapy to your bath with the edition of these stunning LEDs? Simply follow through the options then click 'calculate price' at the bottom of the page. This Pegasus Whirlpool Kit comprises everything you need to convert any acrylic bath into a luxurious Venus 12 jet whirlpool bath apart from a drill and a screwdriver, with comprehensive instructions & telephone support hotline (including evenings & weekends) for those who need some advice as they fit. 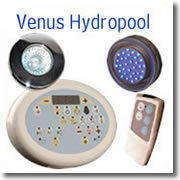 PLEASE NOTE: Due to popular demand we now only supply the Venus Whirlpool Kit with the microjet option. If you wish to purchase the advantage jets please ring us.